Renkus-Heinz has released an update to their acclaimed RHAON II software. 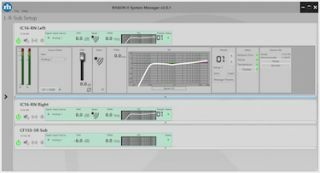 Version 2.0.1 of RHAON II (Renkus-Heinz Audio Operations Network) expands control to all current Renkus-Heinz products, including all Iconyx Gen5 systems, IC Live, IC2, VARIAi modular point source arrays, and CF Series loudspeakers. "We used RHAON II for a recent installation at a historic 100-year-old church, and it was simply fantastic,” said Joe Orlando, president of Commercial Media Systems. “The user interface is well-designed, and it renders so fast, we were literally up and running in 15 minutes." "We do a lot of work in very reverberant spaces, and Iconyx has long been a problem solver for us," said Gene Ingham of RCI Systems. "With the new Iconyx Gen5, Renkus-Heinz has made a good product even better, and the new RHAON II software made the entire project come together even more quickly than we could have anticipated." “The new RHAON II software is easy to use and really fast,” said Mark Simoni of Simoni Systems. “Setting up Renkus-Heinz systems with RHAON II is a piece of cake. Kudos to the Renkus-Heinz team." RHAON II is available now.